Make guava jelly with sweet guava fruit. The guava fruit grows from evergreen guava plants. The plant is popular in areas in Florida and Hawaii due to their warm tropical climate. The fruit is a bright yellow hue and has a strong, sweet smell. 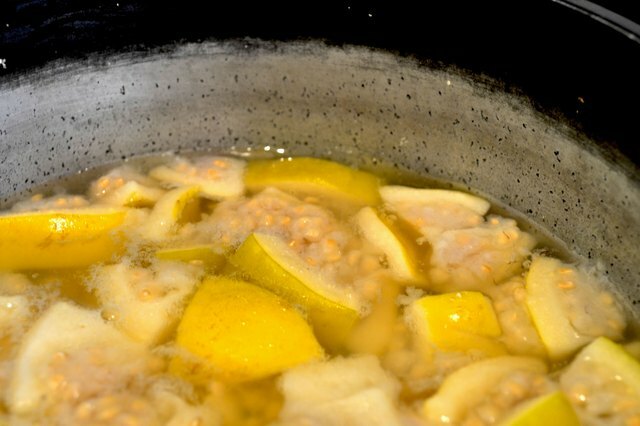 When the fruit boils and is strained with a muslin cloth, the juice left behind contains the key element to make guava jelly. Making guava jelly is easy because it only requires a few ingredients. Inspect the guava. Pick fruit that is ripe and include guava that is ripening. Guava fruit that is still in the ripening stage contains more pectin than ripened guava. 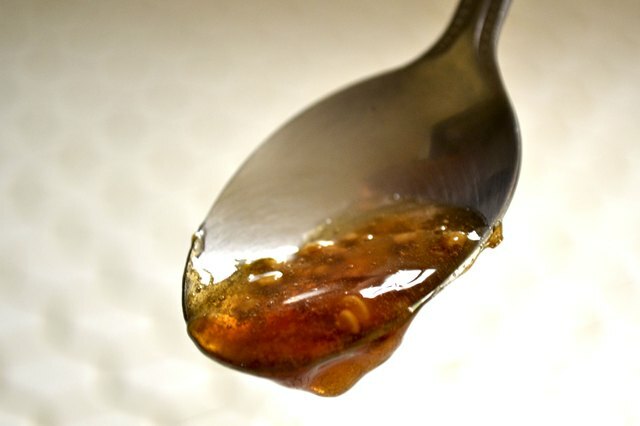 Pectin is a thickening substance that helps create thick jelly. 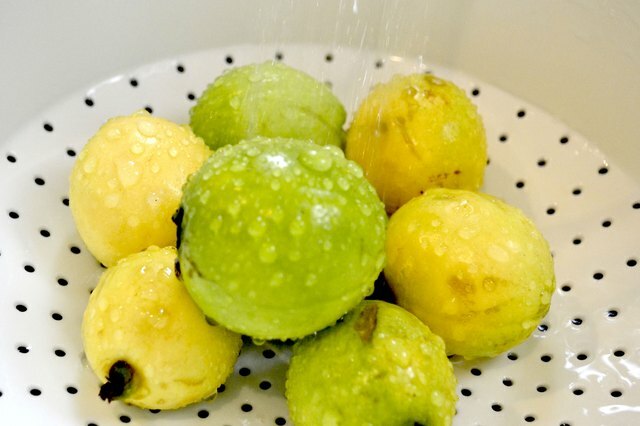 Wash guava under warm water. This removes any dirt, debris and pesticides are present on the guavas. 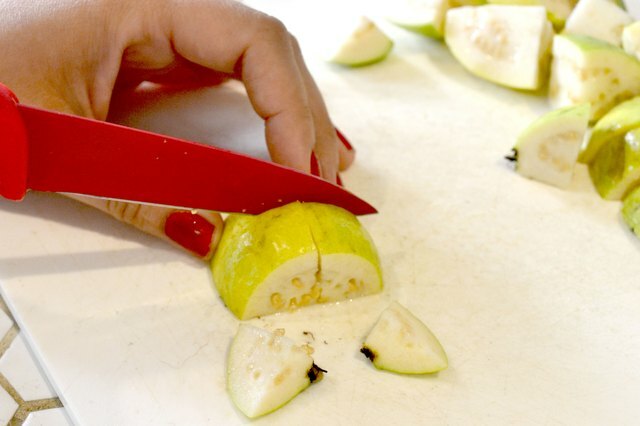 Slice the guava into medium sized cubes. Add guava to a saucepan. Pour just enough water in the saucepan to cover the guava fruit. Boil guava for one hour. Keep boiling guava until the fruit softens. Allow the water and guava fruit to cool. Place a damp muslin cloth over a bowl. 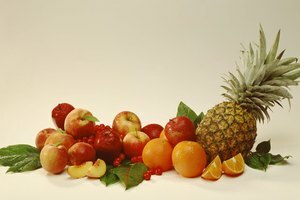 Strain the fruit through a muslin cloth to remove any unnecessary pieces of the fruit. 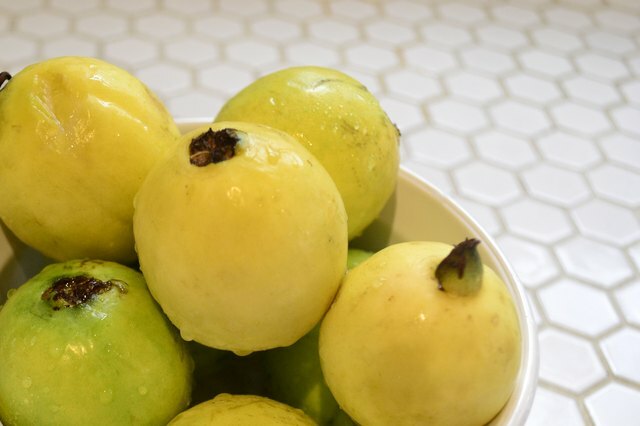 The juice that is left behind will contain the sweet flavoring that makes the guava jelly, and will reside into the bowl under the muslin cloth. Gently squeeze any juice left in the muslin cloth. 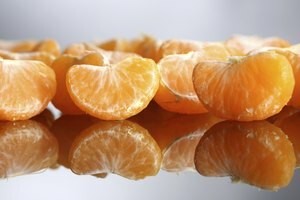 Throw away the fruit's pulp. 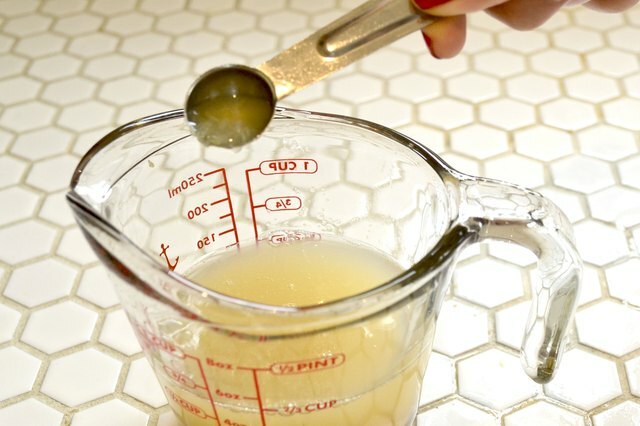 Measure the liquid left behind in the bowl. Add cup of sugar and tbsp. of lime juice for every cup of guava juice. Stir the guava sugar mixture. Add the mixture to a saucepan and bring to a boil. Simmer the mixture under low heat. Continuously stir the mixture until it becomes thick. The jelly will drip slowly from the spoon. Allow the guava jelly to cool for 30 minutes. 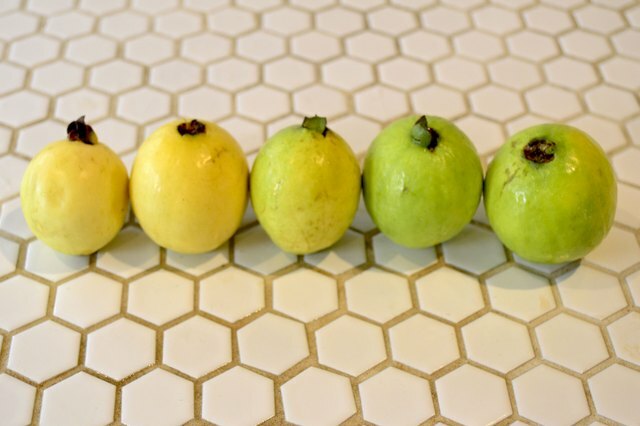 Pour the guava jelly into sterilized canning jars. The guava jelly is still warm, and the heat seals the jars. 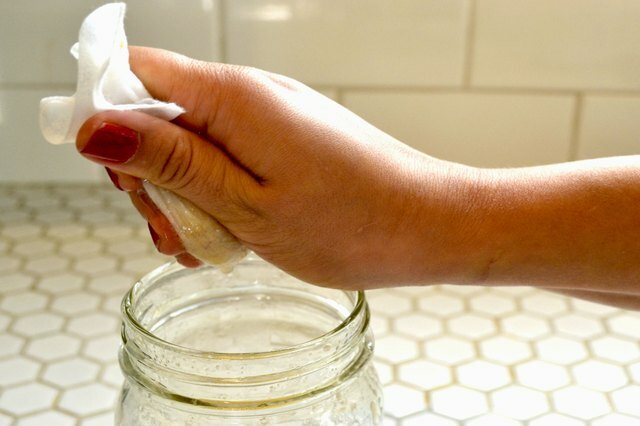 However if the jars do not seal automatically, you can seal the jars by vertically placing them in a saucepan of water that covers 2 inches of the jars. You will hear a clicking sound when the jars seal. Save the guava pulp to make guava cheese or butter. Allow guava fruit to strain in the muslin cloth overnight for more guava juice. Cook only 5 cups of guava juice at a time when making guava jelly. 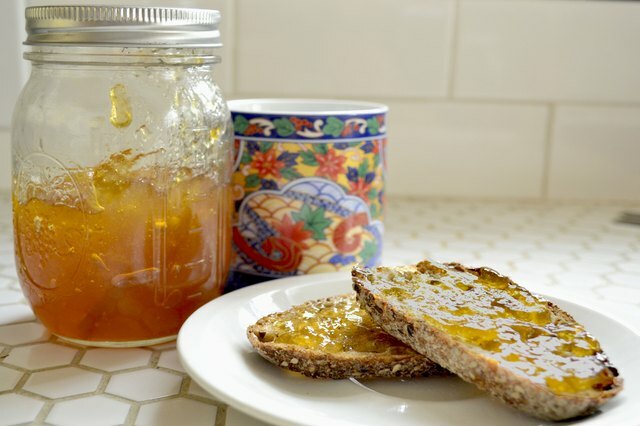 Add commercial pectin to the jelly if you are worried about the jelly's consistency. Add the pectin during the final boiling process.